With broadening the application of personalized immunotherapy in mind, Bobisse et al. set out to identify neoepitope-specific CD8+ T cells in patients with recurrent advanced epithelial ovarian cancer, a type of tumor known to have a low mutational burden. The researchers analyzed peripheral blood lymphocytes (PBLs) and tumor-infiltrating lymphocytes (TILs) from 19 patients who had previously been heavily treated with chemotherapy but had no exposure to immunotherapy. First, the team used whole exome sequencing and genome mapping tools to rigorously identify nonsynonymous somatic mutations; then, they utilized the NetMHC algorithm to predict neoepitopes that were likely to bind with high affinity to the patients’ cognate HLA-I molecules. By stimulating CD8+ PBLs with pools of predicted neoepitopes, the researchers identified PBLs specific for HLA-I epitopes in 6 of 19 patients. The neoepitopes were specific to each patient, suggesting expansion of a pre-existing response rather than priming of naive T cells, although this could not be fully ruled out. In patients with detectable neoepitope-specific PBLs, immune activation gene signatures in their tumors were enriched, while stroma signatures were attenuated. Turning to TILs, the researchers analyzed tumor samples that were available from 14 of 19 patients. They non-specifically expanded TILs using standard culture conditions (high-dose IL-2) and then interrogated the expanded cells with pools of predicted mutated peptides. Neoepitope-specific TILs were identified in 4 of 14 patients. Overall, neoepitope-specific PBLs or TILs were identified in 9 of 19 patients, representing a total of 14 neoepitopes. 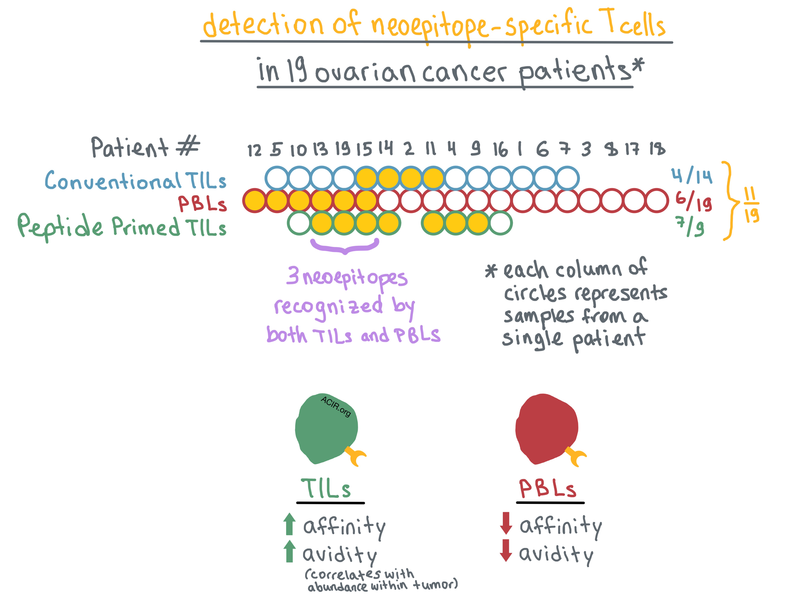 However, PBLs and TILs recognized different, mostly non-overlapping neoepitopes, with only one neoepitope identified in both cell populations; this discordance was confirmed by TCRβ sequencing. Bobisse et al. hypothesized that this difference may be reflective of the limitations of the T cell expansion methods rather than actual absence of overlap between neoepitopes recognized by TILs and PBLs. To that end, they combined high-dose IL-2 with predicted mutated peptide pools to expand TILs from 9 of the patients. With this method, neoepitope-specific TILs were identified in 7 of 9 patients; combined with the PBL data for the same patients, overall neoepitope-specific T cells were detected in 8 of 9 patients. Combining all three methods, neoepitope responses were detected in 11 of 19 patients. Nevertheless, only 3 of the identified neoepitopes were recognized by both PBLs and peptide/IL-2-expanded TILs. Determined to understand the discrepancy in neoepitope recognition between PBLs and TILs, the researchers focused on two neoepitopes that were recognized by clones within both T cell populations. They measured the functional avidity (the peptide concentration sufficient to produce IFNγ response in 50% of cells) in these T cells, and found that all tested TIL clones exhibited avidity over an order of magnitude higher than the corresponding PBL clones. Moreover, based on TCR sequencing, high-avidity TIL clones were more abundant in the tumor than low-avidity TIL clones. TILs and PBLs recognizing the same neoepitope had no overlapping TCRβ sequences, prompting the researchers to examine TCR affinities of these T cells. The team utilized homology modeling together with the TCR α and β chain sequences and the cognate peptide and HLA sequences to predict molecular interactions between the dominant TCRs in PBLs or TILs and the peptide-MHC (pMHC) complex. The results of the modeling indicated that the TIL TCRs would have higher affinity (strength of interaction between TCR and pMHC) for the pMHC than the PBL TCRs. Bobisse et al. suggest that the higher affinity is likely responsible for the higher avidity of TILs versus PBLs, although other factors may also play a role. Overall, Bobisse et al. found that adding predicted mutated peptides to high-dose IL-2 may help identify more neoepitope-specific T cells in tumors with low mutational burden, and they provide evidence that neoepitope recognition and avidity can vary significantly between T cells found in the blood versus the tumor, with higher-avidity T cells found preferentially in the tumor. These findings expand the possible sources of T cells/TCRs for future development of adoptive T-cell therapy. Bobisse S., Genolet R., Roberti A., Tanyi J.L., Racle J., Stevenson B.J., Iseli C., Michel A., Le Bitoux M.A., Guillaume P., Schmidt J., Bianchi V., Dangaj D., Fenwick C., Derré L., Xenarios I., Michielin O., Romero P., Monos D.S., Zoete V., Gfeller D., Kandalaft L.E., Coukos G., Harari A. Sensitive and frequent identification of high avidity neo-epitope specific CD8 (+) T cells in immunotherapy-naive ovarian cancer. Nat Commun. 2018 Mar 15. Hibino et al. demonstrate that Nr4a nuclear receptors, which regulate Foxp3 expression and global transcription in Tregs, can be inhibited to break immune tolerance in the tumor microenvironment. Selective deletion of Nr4a1/Nr4a2 factors within Foxp3+ Tregs, or a combination of chemotherapeutic agent camptothecin and a COX-2 inhibitor, reduced tumor growth in mice with transplanted colorectal or lung cancers in a CD8+ T cell-dependent manner, enhancing IFNγ production in CD8+ and CD4+ intratumoral T cells and activation markers in intratumoral DCs. Buchan et al. evaluated the synergistic effects of CD27 agonism with anti-PD-1/L1 blockade. An agonistic anti-CD27 antibody increased the proliferation and effector function of CD8+ T cells, delayed tumor growth, and enhanced survival in multiple tumor models, including in human-transgenic CD27 mice, when used in combination with anti-PD-1/L1. Combination treatment dramatically promoted levels of Myc protein, a driver of CD8+ T cell proliferation, and depended on IL-2 levels, demonstrating a potential mechanism for the synergistic effects. Agonism of 41BB (CD137), a costimulatory molecule in the TNFR family, has profound consequences on the metabolic state of CD8+ T cells, as revealed by Menk et al. Signaling through p38-MAPK and upregulation of PCG1α leads to increased mitochondrial mass, mitochondrial fusion, and increased available ADP, positioning the cell for a rapid metabolic response. 41BB agonism, even transiently, enhances the impact of anti-PD-1 therapy and adoptive T cell therapy, highlighting the importance of metabolic sufficiency of antitumor T cells. Using a murine mammary tumor model and a Clec9A-diphtheria toxin receptor mouse that can be depleted of specialized cross-presenting CD8α+ and CD103+ (DC1) subsets, Gilfillan et al. determined that in the context of poly I:C immunotherapy, DC1 subsets were not essential to mount a CD8+ T cell mediated antitumor response; both DC1 and XCR1- DC2 subsets were able to take up tumor antigens in vivo, and could cross-present antigen to T cells in vitro. While the DC1 cells were more effective as stimulators, DC2s were more abundant in draining lymph nodes. Petrov et al. target CD33, commonly expressed on acute myeloid leukemias (AML), and CD123, a marker of leukemic stem cells, to eliminate both and prevent relapse in AML through use of a “compound CAR” (cCAR). cCAR T-cells eliminated cell lines or patient tumor cells expressing the targets in vitro, and reduced tumor burden while prolonging survival in xenograft murine models; at sacrifice, virtually all human cells found in the peripheral blood were cCAR T-cells. Alemtuzumab, an anti-CD52 antibody, eliminated cCAR T-cells in both peripheral blood and tissue. Kato et al. established a two-week protocol using partially HLA-matched healthy donors to rapidly identify TCR sequences recognizing patient-specific neoantigen epitopes, and demonstrated that these TCRs were target specific following transfer to third-party PBMCs. A single round of in vitro stimulation, dextramer sorting, and NGS determined the paired α and β TCR chains. Interestingly, a TCR identified against a neoepitope for which the anchor residue was mutated reacted with both mutant and wild-type peptide:MHC, warranting increased scrutiny of potential neoepitopes.